Everything went well in the project, although we did have some slight problems with a few families. 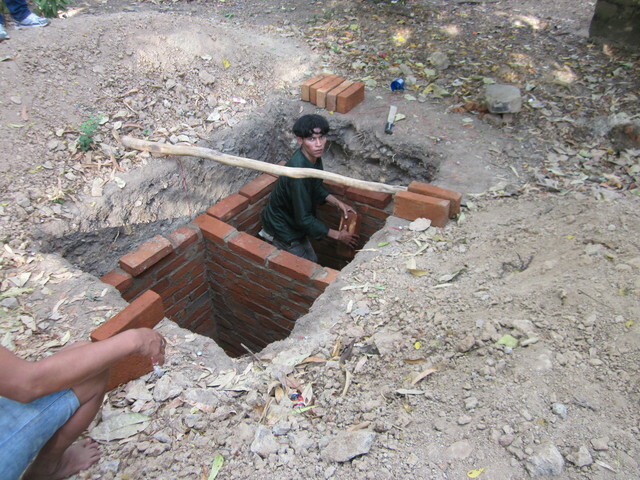 One woman tried to build her latrine with a different design, and staff felt it would not be sanitary in the way she had proposed. They tried to convince her to change, but the woman got upset and asked (not politely) the staff to take the materials back. Also, several husbands, once they saw the metallic superstructure, decided they did not want to continue with the project and refused to complete the latrines, saying they were "too hot". Unfortunately, the wives attended the meeting and were in agreement with all of the aspects of the project, but the men still have a lot of power and did not allow the women to complete their latrines. Part of the sustainability model, as well as having the families build their own projects so they know how to fix it if anything goes wrong is the local contribution. Once the families have paid for some part of the project, they begin to realize they do not have to wait for the government to build them a latrine again (and many have been given away for free over the years). As mentioned, we need to try to get the men and the women to attend the early commmunity meetings so that all are on board with the different responsibilities of the parties. Although it tends to be just a few cases, if we can get both the men and the women on board, we may be able to get even closer to 100% coverage in sanitation. 71 families and 264 people received 61 double pit latrines. Hygiene and environmental education is currently being provided through a train the trainer program.